When you suffer sunburn to the point of getting blisters on your skin, certain home remedies can help get rid of the blisters and relieve other painful symptoms. Taking steps such as drinking more water, wearing loose-fitting clothing, and applying aloe-vera lotion are great ways to treat the pain and blistering of sunburned skin. Don’t touch your blisters. When treating painful sunburn blisters, the most important thing to remember is to not touch them. You may be tempted to scratch the blisters or even pop them, but this can make your pain worse and will open the blisters up to infection. Moisturize. One of the best ways to get rid of your sunburn fast is to moisturize the area with lotion that contains aloe vera. Make sure you aren’t using lotions with petroleum, benzocaine, or lidocaine in the ingredients, as petroleum can trap heat in your skin, and benzocaine and lidocaine can cause irritation. Drink more water. Lotion isn’t the only way to moisturize your skin after getting a sunburn. Just by drinking plenty of water, you can prevent dehydration and help keep your skin moisturized. Wear loose clothing. If you have painful blisters on your skin, the worst thing you can do for your pain is wear tight, restrictive clothing. Stick to loose shirts and pants and try not to place too much pressure on your skin. Treat sunburn with a cold compress. To relieve your skin of some of the heat it is holding in, try placing a cold, damp towel or washcloth on your skin for 10 to 15 minutes a day. When taking a shower or bath, try to use cool or cold water. Seek help if you feel sick. Dizziness, nausea, and fatigue can all be signs of sun poisoning. 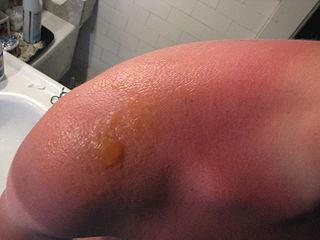 If you feel sick after getting a sunburn, you should seek medical attention immediately. When your sunburn symptoms are severe, FastMed Urgent Care can provide you with treatment. Our locations are open seven days a week, making it easy for you to get the compassionate care you need, when you need it. 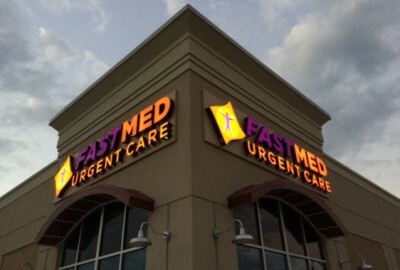 At FastMed Urgent Care, our mission is to positively impact the lives of our patients and their families. Find a location near you today, and let us help you quickly treat the pain from your blistering sunburn!